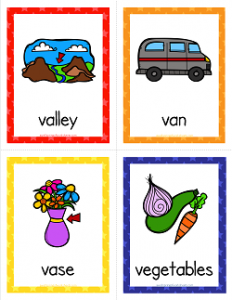 When you think of things that start with v, you’ll come up with pretty much the same words that are on these cards: valley, van, vase, vegetables, vest, vine, violin, and volcano. You might have also thought of vulture, but how often do kids see a vulture? Less often than a valley, which you will be teaching about in your science lessons! Please have fun and enjoy using these cards in your lessons with your kiddos.